After the hectic preparations and an immaculate parade, the soldiers who have come from various regiments around the country need to celebrate the success of the picture perfect republic day. And these celebrations take place in a traditional way – called the Beating Retreat. 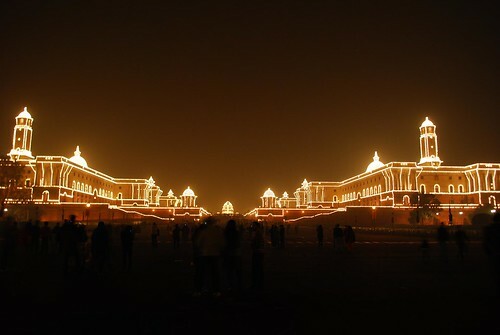 The North and South block along with the Rashtrapati Bhavan are beautifully illuminated. Thepresident comes, unfurls the flag and there is a band and another march past by the three pillars of India’s defense – Air force, Navy and Army. 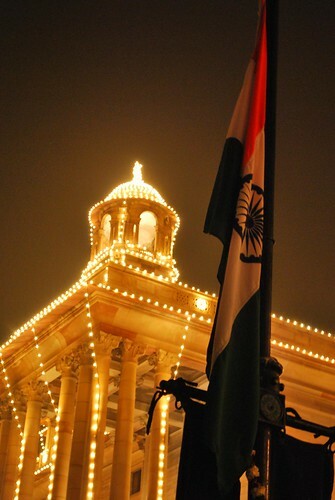 Talking of pillars, there is an interesting story behind the Rashtrapati Bhavan. It is said that Edward Lutyens, the chief architect had wanted the palace to sit majestically, all by itself on top of the Raisina Hill. But he was forced to have the two buildings – North and South block alongside it. So he placed a 145 foot Jaipur column in front of the palace which in a way spoils the whole view. The 145 foot Jaipur Column – Spoils the view? You know what? I could never see this function live and always watched it on TV including this year. All the 3 shots are beautifully captured. For the last one… ummm…. yes from the front it spoils the view. maybe 15-20 degrees plus/minus would have been better angled. 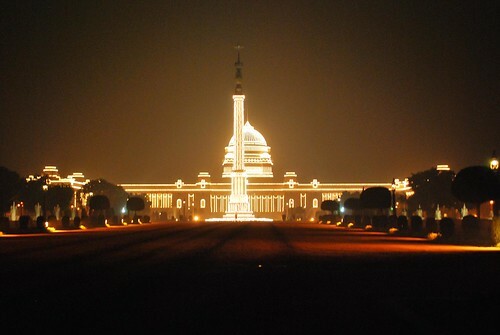 Main aim was to click the place all lighted up. But even with the pillar it looks beautiful. Is it very difficult to get there on this day?